Well here it is--the moment I'm sure you've all been waiting for. The Center for a Stateless Society is raising funds for the month of May to pay all us writers for what we've already done. The good news (great news!) is that there's currently $220 coming in automatically through the true fans system (i.e. the monthly PayPal subscription option). With $220 of the $1455 monthly budget (around 15%) now funded automatically, that leaves $1235 for May. If enough people subscribe for a modest monthly subscription (just a few dozen people choosing the $10 or $25 option would put us over the top), it's quite conceivable you'll never have to read any more of these blegs. Imagine if Jerry Lewis had a Chipin subscription option and promised he'd go away forever if enough people cooperated! The MDA would be funded through the year 3000. In the meantime, though, we've got $1140 left to raise (I see we're up to $95 in contributions). So if you value the work we're doing at C4SS and have the means to do so, we'd certainly appreciate anything you can throw our way (just go here to contribute or do so with the Chipin widget to the left). Or (again) you can just go here to select a subscription option for some amount you'll hardly even miss every month, and then just smugly sit back and ignore future begathons. Has a Tough Economy Spawned New Alternative Currencies? During tough economic times, alternative currencies have sprung up from as near as small U.S. communities to as far away as tiny South African townships. The onset of the global recession back in 2008 became the catalyst for spawning an entire series of these barter-like systems all over the globe. An alternative currency is a term that refers to any currency used as an alternative to the dominant national or multinational currency system. Alternative currencies can be created by an individual, corporation, or organization, they can be created by national, state, or local governments, or they can arise naturally as people begin to use a certain commodity as a currency. They have a long history based on their popularity and ability to facilitate local commerce. Although the origin of alternative currencies is uncertain, recent examples abound that emphasize their importance in dealing with a protracted crisis. During the Great Depression, U.S. and European governments issued “scrips” to keep commerce flowing when cash was in short supply. Massive barter exchanges were utilized in Argentina during runaway inflation to keep people from starving. And lastly, the city of Ithaca, New York, owes its existence today to the use of “hours” as legal tender to sustain its local economy during the 1991 recession. The appeal of such networks can be found in the impoverished, the elderly, the disabled or the underemployed since they are a means of empowerment for those barely getting by on the economic fringes. Alternative currencies come in many forms, both high and low-tech, but in each case an attempt is made to assign value to an individual’s ability to perform a task or service. There are no forex charts online to follow the trends in these currencies. However, there are records kept and software developed to support these activities as if they were online. Mutual credit systems have been around for some time and keep track of a person’s account while allowing for various exchanges or trades to take place. The debits and credits are posted to accounts as with most any other recordkeeping system. Establishing an alternative currency can at times be a last resort to hold a community together, particularly in small farming areas where services or actual product are more plentiful than paper money. As accommodating as these systems might be, a Nevada politician, Sue Lowden, recently lost ground in her race when she claimed that the way to cut medical costs was to barter with your doctor. Her remarks were roundly ridiculed. However, mutual co-ops spring up in time of need to keep the wheels rolling and mouths fed until harvest time. The CES website points to more than 100 exchanges in 15 countries. Convenience and necessity are the “Mothers” of these inventions. The world of high-tech is not immune to these needs either. In the early days of Internet commerce, banks were totally unwilling to guarantee merchants for Internet sales where their plastic cards, another form of alternative currency, were utilized. Their unwillingness created an enormous opportunity for anyone clever enough to design an electronic currency complete with tight risk management controls. The “breach” was filled with many suitors, from “beenz” to “flooz” to “digicash” and a host of others. The only survivor of the lot was PayPal, not because they were better, but because eBay saw the long-term value potential of their service and acquired them for $1.4 billion. Today PayPal accounts are all over the world, enabling payments and remittances where the banking system options are notoriously expensive. Power to the People, and down with the banks! The events in Europe over the past few weeks have helped to remind us of the key role that fundamentals play in determining the value of foreign currencies. The European debt crisis caused an expected rush of capital away from the Euro and into safe havens like the Dollar and the Yen. An old adage in the world of foreign exchange is that everything is relative. You trade in currency pairs, not in the single currency itself. Its value is relative, since it depends on the stability of the nation’s economy behind it. However, the greatest benefactor of the recent capital flight was the precious metals sector, more specifically Gold. Gold has actually become the “alternative currency” of the moment, whose value is not tarnished by deficit mismanagement or the unintelligible edicts of a central banker. The following chart demonstrates this current phenomenon. 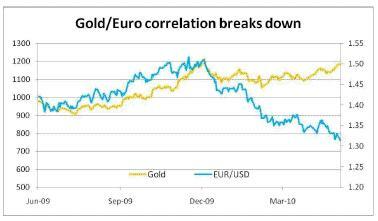 As the Euro has weakened relative to the Dollar, Gold has continued to appreciate in value, ignoring whatever vagaries in the market might be signaling an impending economic crisis. As the original hypothesis states, tough economic times do have a way of spawning alternative currencies. However, a corollary may be that in addition to nominal script or interest-free mutual list loans, Gold, that precious metal that even King Tut took to his grave, is today’s alternative currency of choice.